I’ve fallen behind a couple of days. My dear cat, Lucky, is very ill and I’m giving him all my attention. But I’ll catch up today and take a break from my sick cat duties. Last Thursday, August 19, I had absolutely no interest in working so was dragging and very late to the carpool line. But after a 10-minute wait I had a great ride. As I approached the car – a VW Passant – the driver signaled through her window that she’d take 3 riders, and I thought oh great, she’s planning to make a little profit on the toll this morning. But no! Just the opposite. She said ” no toll”, looking snappy in a bright cherry-red velour cardigan, black pants and a good looking big yellow leather bag. They two guys in the back seat looked happy and put their money back in their pockets. I asked her why no toll. ” If I can’t afford the $5 a day to commute, then I shouldn’t be driving”, she said. “And I don’t think the riders should have to be responsible for my toll.” But she was quick to add that she appreciates the offers of toll payment. She mentioned that her husband, an insurance adjuster, had brought up the question of liability for drivers who charge a payment for rides. I’d wondered about that too, so when I got to my computer later that morning I looked up the California State law on such matters. It turns out there is no extra licensing or fee for driving a car-share or carpool vehicle with the riders contributing to the expense of the commute. So all you toll takers are perfectly legal, I’m sorry to say. The next day, the 20th was a typical Friday light traffic day, Many cars were lined up and I got in the back seat of a Honda sedan. The driver looked like an older version of Miles from “Lost”. He was wearing a short-sleeved white polo shirt with an expensive looking brown suit, the jacket tossed over the back of his seat. He kept flinching as he drove. An unconscious habit perhaps or maybe a nervous disorder. Or maybe, like me, he could use a massage. Near Pinole we pass the In ‘N Out. Many mornings as we go by I think of how good those burgers are and wish I could pick one up for lunch. On this cold cheerless morning, I could use one right now! We whiz past 3 lanes of suddenly congested non-carpool traffic and are in the city by 8 a.m.
Monday, August 23. My god, summer is finally here! No half-way about it! 80s and 90s predicted for today and it’s already comfortably warm at 7 a.m. Very,very nice and somewhat odd to see the sun at this hour! I walk up to a big Honda SUV. It has two rows of back seats and is actually more of a van. The woman driving must be incredibly tiny. Her seat is pushed so far up that the steering wheel is resting on her chest. A colorful cotton bag covered with about a dozen various sized pouches is hanging off the bag of her seat. It looks like those over the door devices that hold multiple pairs of shoes. These pouches are holding kleenex, bottled water, a power breakfast bar. A huge silver crucifix hangs from the mirror. I lean forward and toss a dollar into a little white plastic basket between the front seats. A giant truck with a load of smashed cars go by us. These always fascinate me. It’s something about those neatly stacked layers of colorful metal that were once complex engines and roaring vehicles transformed into silent slabs. Speaking of many cars in small spaces, did you see this picture? These guys need casual carpool! 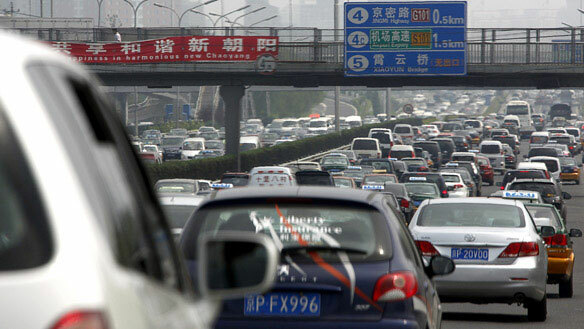 This is part of a 62-hour traffic standstill on a road leading to Beijing! 62 HOURS! Some of the drivers have been trapped in it for three days. I examined the picture carefully and it looks like most of the cars have only one person – the driver. Once again I am delighted to speed past the log-jam of traffic at the toll gates on the Bay Bridge and am thankful for the carpool. The warm weather has lent a tropical flavor to the vegetation near the freeway and there’s a whole patch of the vividly pink naked lady lilies abloom, nodding as we pass. THURSDAY, AUGUST 12. I arrive at the Vallejo carpool site to see at least 50 cars lined up. Nice (for the riders, anyway). I get in the front seat of a Chevrolet pickup. Another passenger is squeezed in the back. We buckle up and get out our toll offerings which are refused. “No money in this truck”, the driver says loudly. “You guys are saving me $3.50 by just riding with me.” He’s a rugged kind of guy, and the truck has a rugged kind of guy smell (not bad, just the way guys smell when they don’t use perfumes). I see part of a large tattoo on his right arm, under his gray t-shirt. He’s a contractor and commutes from Folsom 2 or 3 days a week, sometime on his motorcycle, he says. “I’ve seen vans pull up and get 4 or 5 riders and charge each one of ’em $1.25”, he says. “A lot of drivers are just tryin’ to cash in on this toll thing.” I agree and relate the story of the BMW driver wanting her full $1.25 ‘fare’. (See my July 16 blog – Days of Contention). I comment on the light summer traffic, and he thinks it’s mostly the economy. But he also thinks a lot of people are taking unemployment benefits who don’t deserve them – his brother for one. I don’t want to argue with him, but most people do not have a great time being on unemployment. Their benefit amount is usually a fraction of what their salaries were, and now, for the new group of “99rs” – the people who’ve been on the dole for 99 weeks – their benefits have run out. No more extensions. And no jobs. I know there are people who will always take advantage of situations where money is involved. Look at the banks, look at Wall Street, the credit card companies! And look at the carpool drivers who demand their $1.25 every day. FRIDAY, AUGUST 13. Another ride in a pickup truck today. This is a much bigger, newer Chevrolet, again with a back seat. The rear passenger gets in and is really cramped. I assure her I’ll move my seat forward, which I do. The driver is a big guy in a red t-shirt and a bluetooth device in his ear. I put a dollar in the cup holder, the other passenger passes up $1.25. We talk about our jobs and the economy. He tells me about his divorce a few years ago. “I lost everything – the cars, 2 houses, the works. I just walked away from it.” Sounds like this disaster hit just as the economy was about to cave in, so he’s been scrambling to put his life and job back together. He’s re-married, and has been commuting from Sacramento to pick up work in the city. About the tolls, he says “These bridges were supposed to have been paid for years ago, so what are we paying for now?” I tell him that sales tax was a big part of the revenue for the California transportation agencies, and with the real estate disaster, much of that money is gone. “The sales tax revenue helped pay for road and bridge maintenance, as well as the salaries for people in those agencies”, I point out. “Wonder how much their salaries are” he asks. I wonder too and have been doing some research to find out. (Stay tuned). He thinks that raising the toll fee and charging carpoolers is backfiring. “Look at how many fewer people are on the road”, he says. “So they get a dollar or two more per car in tolls, but 4,000 fewer cars. Stupid!” Looks that way to me too, but I’m waiting to see the numbers in a couple of months. Wednesday and Friday rides take off once again in the chilly gray fog. (I stayed home Thursday). Amazing that only 10 miles away it’s 80 and 90 degree weather. We are cursed with this heavy fog bank along the coast of California this summer and it is a drag. Refreshing, no doubt for visitors from the steamy east. After a frosty 10-minute wait, Wednesday’s ride is a Toyota SUV. The driver was a high energy guy in a crisp dress shirt and jeans. A big good morning. As I handed over my toll dollar I asked him if the riders were all paying up. “Oh yes, everyone is real good about it”. The other passenger pays $1.25. Today (Friday) I was happy to see a line of about 20 or 30 cars waiting for riders. I hopped into a Nissan SUV driven by an Islander-looking lady in a bright chartreuse sweater. A crystal bead rosary swung from the mirror as we took off, flying down the nearly empty freeway at 70 mph. One cup holder appears to hold toll donations, the other was filled with yellow butterscotch candies in shiny cellophane. The cool air was on (it’s 54 degrees) – an ongoing mystery to me why drivers turn on the air conditioning in this weather. Near Berkeley a lone pelican flapped through the super heavy gray fog over the freeway blanketing the bay area this morning. I saw the rest of his flock further on down the freeway, swooping, as only pelicans can, over the bay. The Golden Gate Bridge was invisible in the muck and the city appeared to end at Nob Hill. We whizzed past a nearly empty toll plaza and into the city at 8 a.m. I walked up to the Transbay Terminal for my last bus ride from the 70 year-old building. Demolition begins next week. I asked the driver, “This is the last day I’ll catch my bus here, right?”. “Yah, historical day”, he says with a heavy Russian accent. “Very historical.” He’s excited about the change in locations and goes on to give me a completely incomprehensible description of the new bus routing and where I’ll be catching my bus on Monday. But I’ll figure it out – the new temporary terminal is only a couple of blocks away and is highly visible – all white metal struts poking up into the air. The driver adds that the original plan was to have the buses pull inside the terminal to pick up passengers, but that changed when the city realized it could make better ($) use of the indoor space for vendors, so riders will continue to catch buses outside, as we have been doing at the old terminal. And so the fifth week of the new bridge tolls ends. And the end of the summer that never was is not far off. But here’s the weekend once again and let’s make the most of it. See you Monday. Knowing that the sun will eventually beat back the fog later today and that it will warm up – a little – keeps me going while I stand shivering in this morning’s short line. It’s been a dilemma how to dress each day. A heavy coat is too hot to wear home in the late afternoon, but it sure feels good in the morning. Warm scarves have become my daily accessory. I pass up the first ride – a sporty 2 seat Mercedes, S-500, I think. Too small, too fast, not safe. The next ride is also a Mercedes – a large comfy and safer C-240. No heat in the car, but I’ll survive. I pay my dollar, the other passenger pays $1.25, so this morning’s ride costs our driver a quarter in tolls. Hey, he’s got a Mercedes – he can handle it, right? Another long line of cars and I am in a Toyota Corolla. I and the rear passenger hand over our toll contribution, which is graciously received. A very stylish driver with a great hair cut, who actually looks terrific in her Friday jeans! I mention the construction work going on by the Vallejo Ferry Terminal (new parking structure plus re-modeled Ferry terminal building) and that starts a lively conversation that lasts the entire commute – about Vallejo and its future. She’s a former San Franciscan, who moved to Vallejo several years ago, where she bought a home. “I couldn’t afford to buy in the City.” However, she’s come to realize that her commute expense has made it more expensive to NOT live in San Francisco. “But I could never have bought a house there, and that’s the trade-off.” She’s excited about the potential in Vallejo. Especially, she says, after a conversation she had with a recent casual carpool rider. “He was amazing! He had so many great ideas and actually knew how they could be implemented.” These included, among many other things, corporate headquarters on Mare Island and a light rail connection from Vallejo to BART. She encouraged him to run for office and we agreed that anyone with that kind of visionary energy has an obligation to put it into action. A great ride. Both the Chronicle and Examiner carried front page stories yesterday (Thursday, July 29, 2010) with the latest data on the new bridge toll. The numbers were compared to last July’s traffic and this year there were over 12,000 fewer daily carpoolers on ALL the bay area toll bridges. On the Bay Bridge, the number dropped by 5,350, a 29% decrease from the same time last year. Total traffic also decreased from last year by 3,531 vehicles a day, an 8 1/2% decrease. It looks like some carpoolers may have switched to BART – there were about 1,500 more BART morning commuters in July. Less traffic also meant that the maximum delay on the bridge dropped from 19 minutes to 10 minutes. These numbers undoubtedly reflect the traditionally light traffic during the summer, as well as job loss. The unemployment rate in California is 12.3%, just below Nevada (14.2% and Michigan 13.2%) and in San Francisco, unemployment is up to 10.5%, almost a 1 percent increase from last year. The Metropolitan Transportation Commission is happy with the numbers, and calls the new tolls a success. “We’re raising revenue and seeing decreased congestion”, Steve Heminger, executive director of the Metropolitan Transportation Commission told the Chronicle. Having fewer people carpooling doesn’t seem like a success story to me, but I guess it depends on your perspective. We’ll see how wonderful it is to have fewer people carpooling come September and more cars on the road.